Portable tankless water heaters a great way to provide hot water whether you are on a campsite or in your rustic cabin. Generally they connect to propane tanks to heat the water and also require batteries to ignite the hot water heater. The 13.8 lb., Eccotemp L5 tankless water heater and outdoor shower is our top pick- it can pump water out of the shower head from .5 gallons per minute to 1.4 GPM, includes an automatic ignition, auto shut-off after 20 minutes, and provides a 30-35 degree rise in temperature from your input water. It does require 20-80 PSI of water pressure to work. 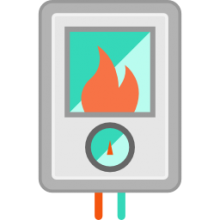 Users have high praise for the Eccotemp, commending its incredible power and ability to supply hot showers on camp sites, remote ministries, and in particularly cold conditions. The L5 Eccotemp ships with the heater body unit, a shower nozzle and hose set, a gas regulator, a vent shield, and a garden hose adapter. Getting these portable propane-powered water heaters up and running can sometimes be a little tricky. Many users say that it was useful to consult YouTube videos in addition to the native instruction manual to get a sense of the best way of installing their units. That said, let's take a look at 5 of the best-selling portable tankless water heaters and showers on the market today and see how they compare. The Eccotemp L5 Portable Tankless Water Heater and Outdoor Shower is a portable water heater that has some nice features- its lightweight and compact, which users like because it makes it very easy to move around. It can generate over a gallon of hot water per minute- is battery operated so no electricity is required. And it comes with a shower nozzle that has different settings- it also has an adapter you can use to attach a garden hose to. Users like the idea that this portable water heater can be easily taken anywhere especially to off-the-grid locations for camping. Reviewers like how easy this portable water heater is to set up, as well as how easy it is to operate once up and running. Buyers also like that it only takes a few seconds for the portable water heater to heat up the water- so there’s no waiting for it to get to the temperature required for a comfortable shower. Another convenient feature is that no electricity is required for operation which means users can basically take it anywhere and have access to a shower. Some users did note that they felt the propane flame was not well protected and blew out easily so one needs to put the portable water heater somewhere away from any breezes. The Camp Chef Triton Hot Water Heater is a portable water heater that can stand on its own or you can use the brackets that come with it to hang up. One of the features that users enjoy is that the shower head that comes with it has four different settings: off, mist, shower, and jet- and that it includes an eight-foot water hose. Users have commended how quickly it will heat up the water. They like the way it automatically ignites when the water is turned on. They have applauded the build quality and enjoy its portability, saying that it folds down easily and can be carried anywhere just like a briefcase. Some users feel that the door on the battery holder is cheaply made and that doesn’t look like it will last long on this portable water heater. Also, it was noted that the on and off positions on this portable water heater are reversed and can cause confusion when first using. Another thing that some users have complained about is that the heat settings for the water on the portable water heater seem to be oversensitive and it’s hard to adjust the water between ice cold and scalding hot. 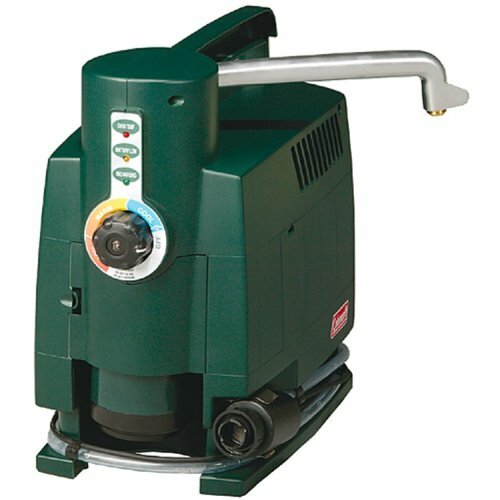 The Coleman Hot Water Heater is a portable heater that can heat water up in as little as 30 seconds and easily connects to its own 5-gallon water carrier. Users like this unit for several reasons- it can be ideal for washing dishes, taking showers, making hot beverages and much more, creating a more enjoyable outdoors, recreational experience. This portable water heater also has a shower head that can be inserted into the adjustable holder it comes with to use as a faucet for a sink. Or it can be detached and used as a hand-held sprayer. This portable water heater comes with a non-kink, 6-foot hose and has a built-in lithium-ion battery which can simply be recharged by using the outlet in your car. It comes with its own charger making it quite easy to recharge. Users have commended how easy it is to use and how much easier and more comfortable their camping experience is when they use this particular portable water heater. They also like how easy the unit is to set up and how good the illustrated manual is- making set up and use of this portable water heater a lot smoother. One drawback is that this portable water heater doesn’t use refillable propane cylinders but instead uses one pound liquid propane cylinders which is far more expensive. The Eccotemp L10 Portable Outdoor Tankless Water Heater is a portable option that is actually designed for a somewhat permanent outdoor installation for places such as cabins, summer cottages, lake homes, campers and the like. However, that doesn’t mean that it must be used in a more permanent situation. This portable water heater is endorsed by reviewers because of the various places that it can be used- and that it specializes in being used in off-the-grid locations. Some users also commended its 20-minute automatic safety shut-off timer, a nice safety feature. This gives one plenty of time to use the portable water heater for whatever use its needed for and conserves propane & water at the same time. Some users, however, have had issues with this portable water heater developing leaks and then breaking down entirely- but this was a minority of users. This Coleman Portable Water Heater is a portable heater option that comes with its own full-sized faucet that easily folds into its handle, which is a feature a lot of users have commended. It can heat up to 40 gallons of water with its 16.4-ounce propane cylinder. 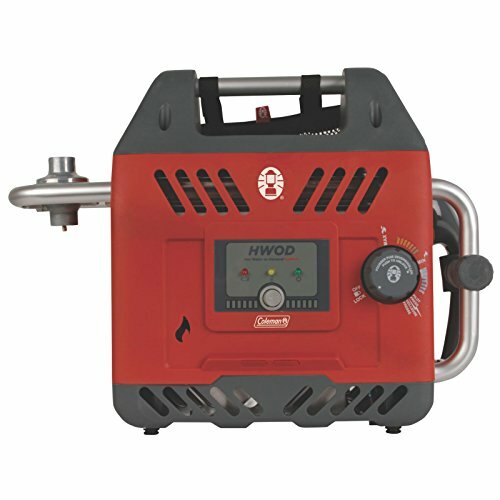 Users can also buy an adapter that will allow them to connect this portable water heater to larger, bulk propane tanks- this way the unit is able to heat up even more water than 40 gallons. When it comes to the water flow- it handles 1 gallon of water per minute when on the warm and cool settings and then it’s about half a gallon of water per minute when put on the hot setting. The battery that comes with it is 6-volt- and it can be recharged in your car or from an electrical outlet. Users like how easy this portable water heater is to use and how quickly the water gets hot. Users write that it is not just good for showers, but also good for washing dishes and other things that might need heated water. Some users have found that the one drawback of this portable water heater is that the life of the battery isn’t as long as expected and has to be replaced too quickly. Favored by off the grid survivalists, some of them also double as outdoor showers-coming equipped with a shower head. While many rough-and-tumble survivalist favor these portable tankless water heaters and outdoor showers, they can often be used in residential circumstances for washing your vehicles, your pets, or just rinsing off the sand after your family has going on a local beach outing. One user amusingly refers to his hillbilly hot tub set up- writing that he installed the tankless water heater nearby his cabin's hot tub to create an impromptu spa for he and his family. 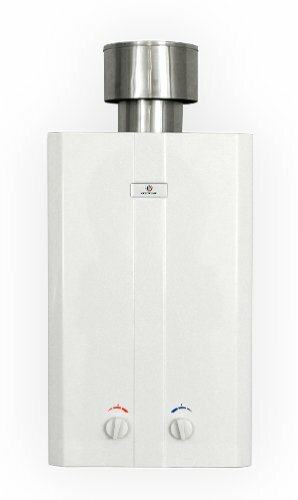 As we have previously mentioned, however, it sometimes requires a handy, DIY type of person to get these tankless water heaters up and running. One user writes that he needed some extra plumbing fittings to handle the adapter threads, as well as to deal with shower and hose connections that were a little leaky. Other users recommend deeply considering where you place an install this unit- saying that it should be protected from the wind because breezes can blow out the propane flame, which will deliver a sudden splash of cold water mid-shower. This means you'll have to relight the flame to continue your hot shower. Another user writes that he uses the hot water supplied from these tankless units to help prepare food in remote, rural areas for an outdoor ministry. These reviewers also purchased predator deterrent lights to keep the pests away at night. Governmental food regulations require hot water- so for church functions, large gyro cookouts for his church, having a hot water heater that provides up to standard temperature water allows the food to be prepared at regulatory specifications. Another user commends these outdoor shower units for their ability to conserve water- saying that since he imports water from a distant location, it's imperative that he ration his daily use conservatively. He's able to get a hot shower without using too much water- the only downside is that he often doesn't want to turn it off because the shower is so surprisingly and refreshingly hot. 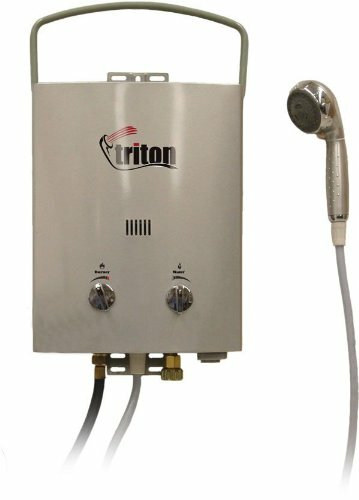 If you are in the market for a portable tankless water heater for your off the grid or camping environment, check out our comparison table above, read reviews from others that have installed these units on their properties, and watch a couple YouTube videos to get a sense of how these tankless units work.